FXOpen announces the launch of the Foreх Article Contest – 3! The holidays are over and we are back again to continue the search for the best writer of Forex-related articles. We have introduced some interesting changes to the contest rules that are sure to fire you up for this activity. The articles will be published in the company’s official blog and will be announced in the social networks. We also offer the People's Choice Award of US$100 that will be given to the author of the most popular article in the social network Facebook. Sign up, be the first to read your peers’ stories, and vote for the most interesting work! The competition starts on January 23rd and will last for 5 weeks. The deadline for your entries is 4 pm on February 28th. Once the contest is closed, the expert judges (which include Forex analysts, representatives of the company’s financial and dealing departments, and the editorial staff) will decide on the winners. To participate in the contest you need a trading account with FXOpen (Registration) and an account on FXOpen Forum (Registration). Just e-mail your entry to [email protected]. 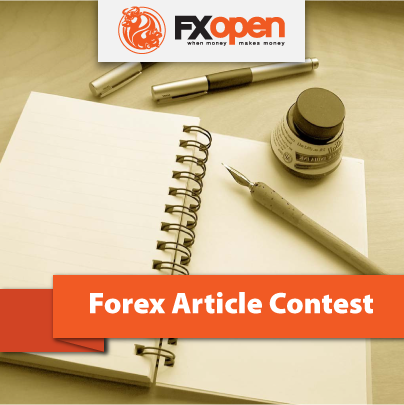 Be sure to provide your FXOpen eWallet number along with FXOpen Forum login, and write “FXOpen Article Contest” in the email subject line. If your work passes moderation, you will receive an e-mail confirming that your article has been accepted. It will be published in the company’s blog with a note indicating that your article is included in the contest. You will also be able to see the other contestants’ stories in the company’s blog. The articles must be between 400 to 1,500 words and written in English. For the work to be accepted, the article must not contain any promotional material, criticism or defamatory comments of other brokers and the services they provide. The submitted material should contain useful information to other traders and those new to Forex. The entries must also contain quality content i.e., duplicate, previously published or plagiarised content, low-quality material, extremely short notes with no illustrations or ‘cut and paste’ articles will not be accepted. The closing time and date for the entries is 4 pm on February 28th. Prize money can be withdrawn via any payment system available within 30 days after it has been credited to the account. There should also be at least 20 trades made in the account. The prizes will be added to the participant’s ECN or STP accounts registered in FXOpen. FXOpen representatives reserve the right to judge the ranking of the competitors and will ensure that fair play is observed at all times. The company’s employees are not allowed to take part in the competition. The contest may be prolonged in case of insufficient number of quality works. Let us help you to start the New 2014 Year with success!